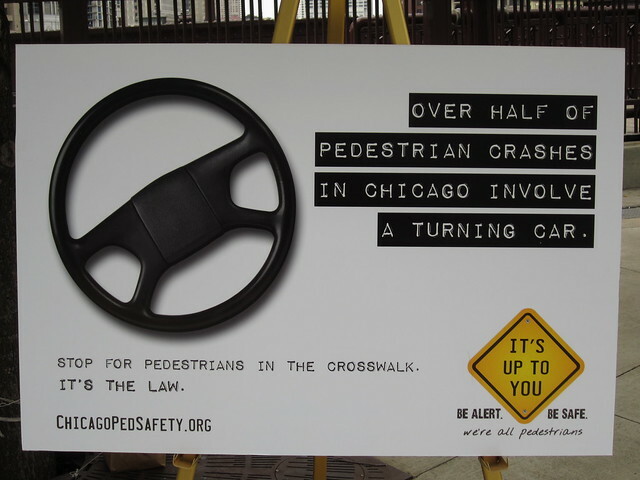 In 2010 there were almost 3,000 crashes involving pedestrians in Chicago, according to CDOT. Drawing upon the agency’s recently released pedestrian crash analysis report, the campaign’s goal is to change behavior by both drivers and pedestrians that leads to crashes. 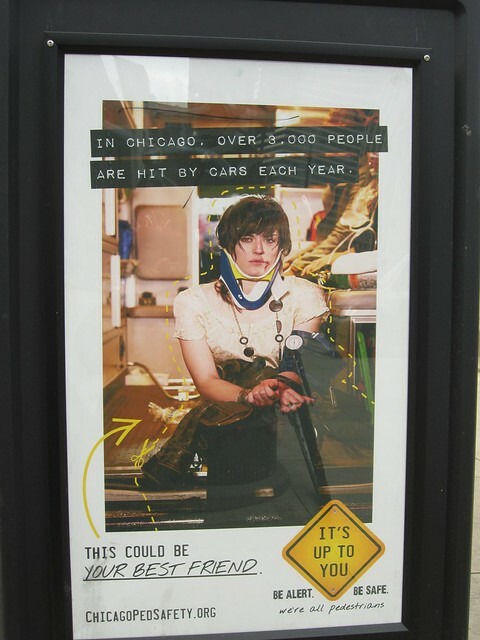 Besides the Cows on Parade-inspired mannequins, the program includes placard ads with messages like “Over half of pedestrian crashes in Chicago involve a turning car – stop for pedestrians in the crosswalk” and “Think before you cross.” A particularly graphic ad shows a driver cowering inside her car with a pedestrian sprawled across the shattered windshield and the text, “This is just the beginning. 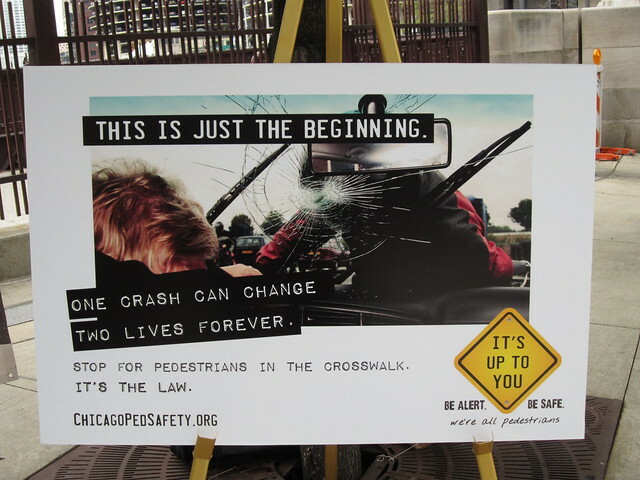 One crash can change two lives forever.” The campaign will also include safety messages stenciled on sidewalks in areas with high foot traffic, small orange crossing flags at neighborhood intersections, and outreach to students, seniors and cab drivers by CDOT’s Safe Route Ambassadors. Yesterday morning a small crowd gathered at for a press conference at Wacker and Wabash, a stone’s throw from where cyclist Jacqueline Michon, 25, was killed by a dump truck as she rode home from Lollapalooza last summer. 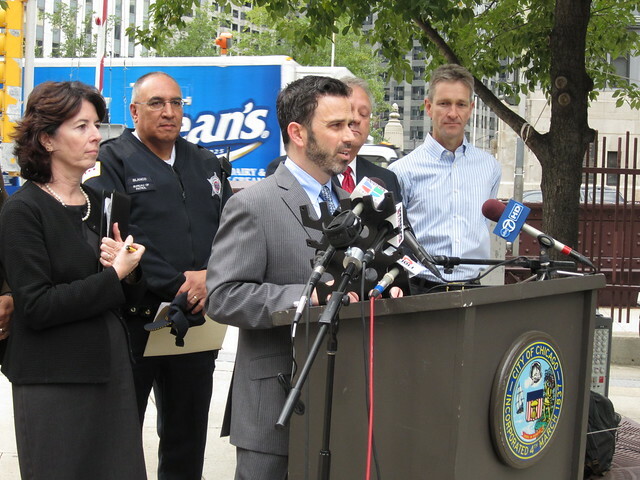 CDOT Commissioner Gabe Klein starts the event with good news: 2010 had the lowest number of recorded pedestrian crashes and fatalities ever recorded in Chicago. But Klein says the numbers are still too high and that the city’s goal is zero ped fatalities by 2020. 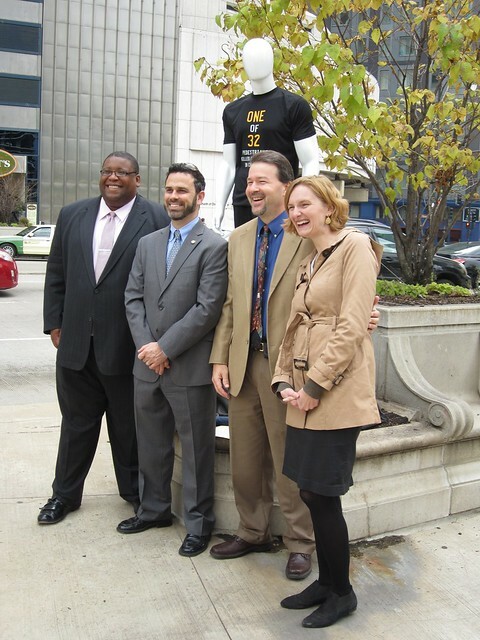 He highlights three basic principals of pedestrian safety that the program seeks to promote. Drivers must obey traffic signals and let pedestrians cross when they have the right of way. Drivers must stop for pedestrians in crosswalks, even if there is no traffic signal or stop sign. And third, “It’s very important for pedestrians to abide by the laws as well to protect themselves,” he says. David Strickland, far left, CDOT Pedestrian Coordinator Kiersten Grove, far right. Lieutenant David Blanco from the police department’s traffic section tells the group that police will continue to work with CDOT to identify locations for targeted enforcement of the state law requiring drivers to stop for peds in crosswalks, as well as enforcement of the speed limit. “Getting behind a wheel means you are responsible … for your life and every other driver, pedestrian and bicyclist that’s on the road,” he says. “The problem seems to be [motorists] turning into crosswalks and hitting people, like the 86-year-old woman on Sheridan [two months ago],” he says. “A taxi took a left turn and ran her over and killed her.” Klein says the city will be focusing on enforcement of traffic laws, educating motorists about the dangers of the distracted driving, and engineering streets to make them safer, perhaps eliminating left turns or right-on-red at some intersections. He adds that CDOT is releasing a draft of the Chicago Pedestrian Plan for public comment this fall and will publish the final document this spring. “That plan is going to be focused on action and making change,” he promises. 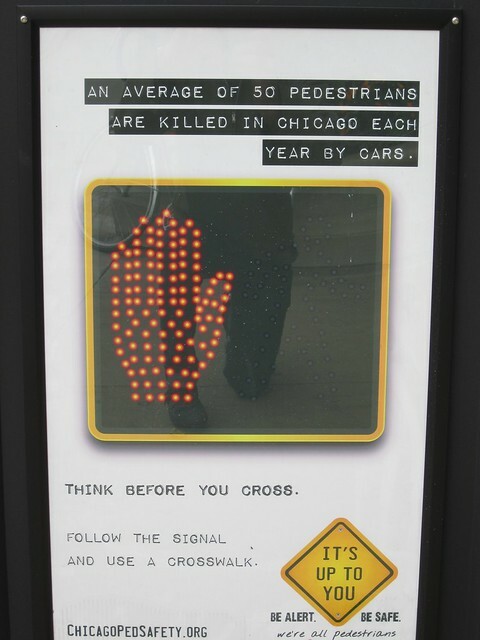 @ShamilC2 Tweeted:”Let us be reminded that these ‘dummies’ represent real people who were killed by vehicles in Chicago. It’s serious!” She makes a good point, and I certainly meant no disrespect to the 32 crash victims or their families, so I have edited the title. How on earth did the cab driver in the Coral Kier case not get charged with criminally negligent manslaughter? Here’s a Tribune article about this issue, written shortly after Ms. Kier’s death: http://tinyurl.com/coralkier.